Minivans tend to get a bad rap but they too can be classy and elegant in their own ways. 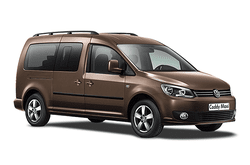 The VW Caddy Maxi Automatic is a 7 seater minivan that is well made and surprisingly good to drive. It seats seven quite easily and has ample storage room in the boot. It comes with a manual drive, air backs, anti-lock brake system, gets great mileage, is rated for low Co2 emissions, and has several colours that you can choose from. Van rentals are a big deal but you are making a great choice with this newest offering from Volkswagen and you are sure to be the talk of the town in you stylish Caddy Mix minivan! Reserve yours today and experience minivans done differently!